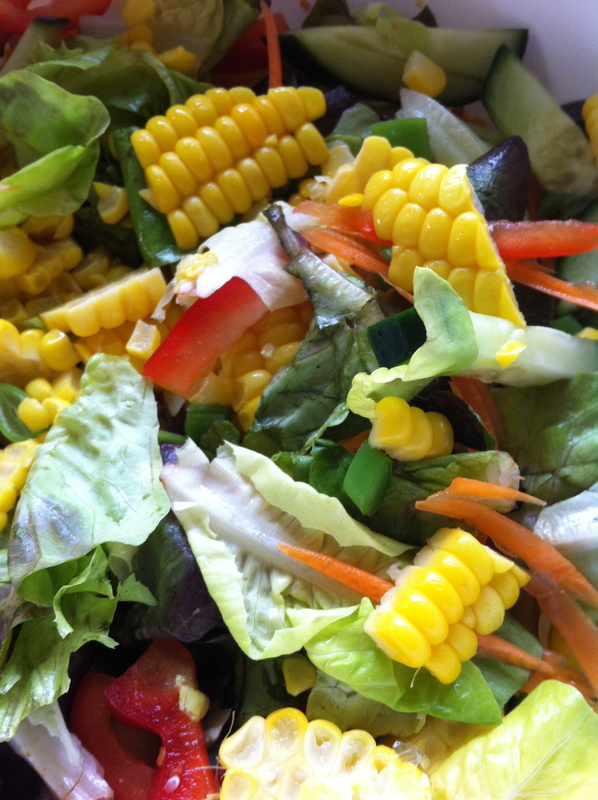 I love fresh corn, and at this time of year it ends up in so many meals, even a bright summer salad. Right now fresh corn, sweet peppers, cucumbers and green beans are all in season along with delicate greens. Blend in food processor until smooth, and then gradually add in 1/3 – 1/2 cup very good quality extra virgin olive oil. I usually start with the 1/4 tsp chile flakes, and 1/3 cup olive oil. Taste once it is all smoothly blended. Add a little more chile flakes if you think you can handle it, and add olive oil as needed. Taste and adjust salt and pepper if necessary. This entry was posted in Recipes, Salads and tagged basil, corn, cucumber, greens, peppers, salad, vinaigrettes by Chatty Kathy. Bookmark the permalink.